Unpasteurized Honey from the Niagara Region of Ontario, Canada. Raw and unpasteurized golden honey, comb honey, liquid wildflower honey. 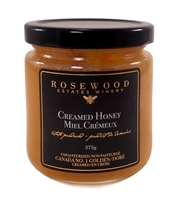 Rosewood Estate Winery Honey, Beamsville Honey, Charlie Bee Apiaries. Ontario No.1 Golden.